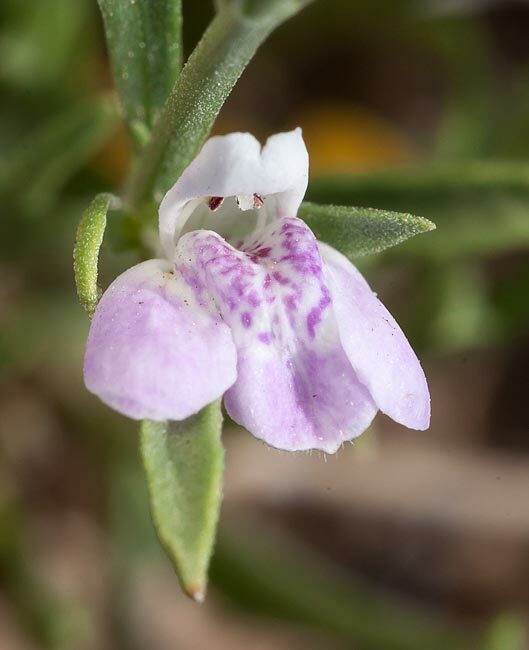 Description: Suffrutescent perennial, 8-15 cm tall; leaves sessile, linear to oblanceolate, strigillose, mostly 10-15 mm long, 1.5-4 mm wide, acute to rounded at the apex, margins flat; flowers solitary, sessile in the leaf axils, bractlets linear-subulate to linear or oblanceolate, 2.5-6(11) mm long; calyces 4-lobed, 2.5-4.5 mm long; corollas 8.5-12 mm long, purple; fruit 7-8 mm long, glabrous or with a few scattered trichomes at the tip; seeds flat, 2.5-3.5 mm long, 2.5-3.5 mm wide. Flowers April to June. Similar Species: The leaves of Justicia warnockii are 1 mm or less wide and glabrous. Justicia warnockii is not presently known from New Mexico. The genus Carlowrightia is distinguished by stamens being appressed to the lower corolla lip. The stamens of Justicia are appressed to the upper corolla lip. Distribution: New Mexico, Eddy County; Texas, western edge of the Edwards Plateau. Habitat: Limestone benches in Chihuahuan desert scrub; 1,190 m (3,900 ft) in New Mexico. Remarks: This species has been infrequently observed in New Mexico. Conservation Considerations: Additional field surveys are needed to determine this plant's range, abundance, and habitat requirements. Daniel, T.F. 1980. The genus Justicia (Acanthaceae) in the Chihuahuan Desert. Contributions from the University of Michigan Herbarium 14:61-67. Daniel, T.F. 1984. The Acanthaceae of the southwestern United States. Desert Plants 5:162-179. Henrickson, J. and M.C. Johnston. 1997. A flora of the Chihuahuan Desert region, ed. 1.2, 2 vols. Published by J. Henrickson, Los Angeles (trial version for correction).